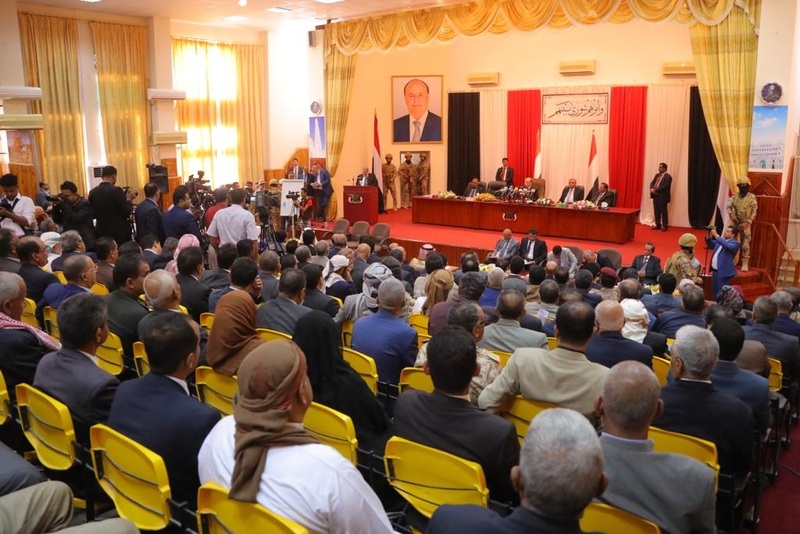 The Yemeni Parliament on Sunday held its second session in Seyoun City to discuss the government 2019 budget and program, in the presence of Prime Minister Maeen Abdulmalek and some of ministers, parliamentary sources told Debriefer. On Saturday, the Parliament held its first session under legitimacy since war started in March 2015, between the internationally-recognized Saudi-backed government and the Iranian-backed Houthis, who still control most populated provinces in northern Yemen. Amid tightened security measures, in the presence of President Hadi, his deputy and premier, 145 lawmakers unanimously elected Sultan al-Barakani as speaker and Abdul Aziz Jubari, Mohamed al-Shadadi and Muhsin Basera as deputies. Last Wednesday, President Hadi called for the session in the eastern governorate of Hadhramout under Yemeni law allowing for the president to locate any area inside the country, when it is insecure, to hold parliamentary session. According to sources, the premier highlighted the key aspects of his budget ad hoc prepared to suit the ongoing conditions and developments in the war-torn country. On Saturday, Houthis announced in Sana'a the commencement of by-election to fill in vacant seats in areas under their control.